Vegas worries: Will international tourists stay away? Will international tourists keep coming? 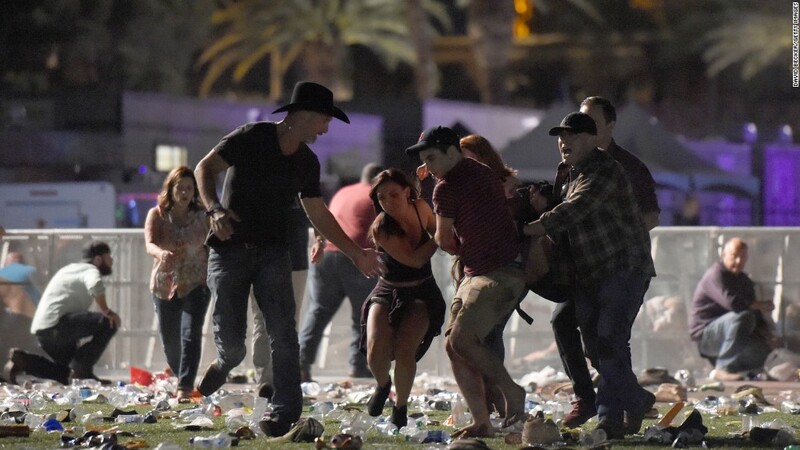 It's a key question to be answered as Las Vegas grapples with the aftermath of the deadliest shooting in modern U.S. history. More than a quarter-million people work in the city's hotels, restaurants, bars and casinos. Their jobs are supported by 43 million tourists a year, a fifth of whom come from abroad. Put another way: 1 in 10 international visitors to the U.S. stops in Vegas. "The recovery time [for Las Vegas tourism] will depend on media coverage of the aftermath and the authorities' ability to spread a feeling of improved security," said Olivier Jager, CEO of travel intelligence firm ForwardKeys. Travel experts say that Americans will continue coming to Vegas since the gunman appears to have been working alone, with no known connections to terrorist groups. The public generally interprets this as a sign that future attacks are unlikely. "Visitors are resilient when it comes to this kind of isolated incident and do not relate it to the destination," said the World Travel & Tourism Council. "Although this attack is unprecedented in its scale and tragic impact, we believe that travel and tourism to Las Vegas will hold up." But there are more concerns about how international travelers may react. "I think it's more international [tourists who] might cancel because they're afraid of the gun violence in the United States," said Diane Bean, a travel agent based in Maine who runs her own company, Off On Vacation. Americans own the most guns per person in the world, with about four in 10 saying they either own a gun or live in a home with guns, according to a recent Pew Center study. There are more public mass shootings in America than any other country. But those statistics have been true for years. "There are so few places in the world that are untouched [by violence or danger]," said Bean. "Not everyone can afford to go to Tahiti." 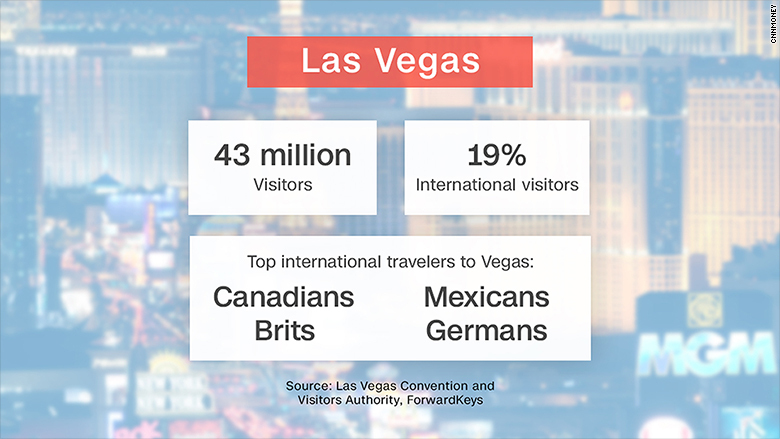 Canadians, Brits, Mexicans and Germans are most likely to travel to Las Vegas, according to ForwardKeys. Like Americans, they visit the desert city for the gambling, weddings, theater performances, conferences, hot weather and lavish night life. Patrick Surry, chief data scientist at travel firm Hopper, said demand for Vegas trips should rebound even if there are a flurry of cancellations this week. "People have short memories and it's probably not a long-lasting impact on travelers," he said. Paris and London, for example, have remained resilient in the face of violence. Fewer visitors came to Paris following a major terror attack in 2015. But numbers have rebounded in a big way, with hotel stays increasing by 10% in the first half of this year. Demand for trips to London, which welcomes about 19 million travelers a year, has held up following the June attack near London Bridge. Overseas visitors to Britain surged by 6% in July over the previous year, setting a new record for the month. Vegas has one more card up its sleeves: Conventions and conferences, which attracted 6.3 million people to the city last year. One good sign: Trade show organizer IMEX Group said in a statement that it plans to go ahead with a conference scheduled for next week.